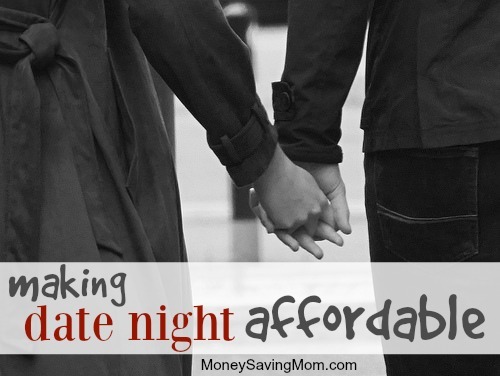 Over the years, my husband and I have always prioritize time together… even when money was tight, we just got creative with how to make date night affordable. After all, the purpose of date night is to relax, to have some fun, and to reconnect with your spouse. None of these things require money. A date that achieves these goals is a success, and it doesn’t have to be expensive! If you’re looking for a few ways to make date nights more affordable, these suggestions might help! 1. Swap Babysitting with Friends. We are blessed to have friends from church who live nearby, and about once a month they babysit for us, and then we babysit for them. This way we both get regular dates, save money, and know that our kids are having a fun play-date with a family we trust. 2. Save Money Eating Out. If you choose to go to a restaurant, there are lots of ways (in addition to couponing) that you can save. My husband and I frequently share an entrée. Sometimes we order an appetizer, entrée, and dessert, and share all three dishes. The point isn’t to stuff ourselves, but to enjoy tasting different dishes and having conversation. If we’re still hungry when we get home, we have a snack. Sometimes we eat dinner at home, and just go out for dessert. Planning our date for lunch hour can also cut costs. And though we both enjoy a good glass of wine, we usually skip alcohol at restaurants and wait to enjoy our wine at home. 3. Try an Activity Date. During financially tighter seasons of our marriage, we’ve skipped the restaurant altogether. One of my favorite date memories was when my husband was out of town for work all week. When he came home for the weekend, I asked a friend to watch our kids, and I packed a picnic dinner in a cooler. We walked through a park, found a bench overlooking a river, and ate and talked there. It was one of our most romantic dates — and totally free! One year for our anniversary we purchased two pieces of dessert from a local country store, took those to the park, ate them together in a pavilion, and then walked around. It was a special, relaxing date for under $10. Our most recent date was only $2.50! We browsed the small shops in the Old Town near us, ending at a coffee shop where we shared a cup of tea. There are so many activity dates outside the restaurant you can try for little cost — dancing, hiking, or seeing a matinee movie are just a few ideas. Last year when I was pregnant and then caring for an infant, going out of the house often seemed like too much trouble. Instead, we perfected the art of stay-at-home dates. The older kids went to our friends’ house, and we enjoyed a few hours of quiet without them. The rule is to turn all your work off! This is time to catch up on each other, not your projects. Ideas for a fun stay-at-home date include a candlelight dinner in the dining room, a board or card game, a movie on the couch, etc. etc. Don’t let budget constraints stop you. We all know there is no price tag on love, relaxation, and happiness. No matter how much or little you have to spend, you and your spouse can prioritize meaningful time together. What are your best affordable date night suggestions? Lisa Adams lives in the Shenandoah Valley with her husband and three children. She home schools, teaches part-time, reads, and blogs at . But most importantly, she loves Jesus and lives to worship Him. Great suggestions! When the weather’s nice, my husband and I enjoy finding something to do outside together – hiking, disk golf, tennis at the park, bike riding, geocaching, etc. On the rare occasion that we have an entire Saturday, we’ll chat and listen to music while tackling a house or woodworking project, then we snuggle up that evening for an at home dinner & movie date. I think all the suggestions are great! Unfortunately my husband would not be ok with splitting anything except maybe an appetizer or dessert. If I even suggested splitting a $2.50 cup of tea, he would probably never go with me again! Some things, we don’t split: restaurant purchased hot beverage or ice cream dessert! LOL We do rely on coupons to help defray the cost when we do go out. Thanks again. One great online resource is the Better Marriages website (formerly called Association for Christian Marriage Enrichment or something like that). They have a lot of free online conversation starters, worksheets, exercises, etc. that my husband and I have used when we were part of a marriage enrichment group at our church and during our pre-marital counseling. Some of our best date nights have been simple activities like those mentioned in the article paired with awesome conversation. They have about 20 free printable activities on there. Titles like “I feel loved when…” , “That’s what I like about You”, “Nurturing an Intentional Relationship,” “Achieving your goals… together”, and lots more on money, conflict management, etc. Highly recommended. Right now through the end of Feb Subway has $6 foot long subs. Go order a sub and share drink water and then take a walk. $6.00 tax meal and free activity! We like to go out for lunch dates. The restaurants are usually less crowded and if they have a lunch menu, it’s quite often less expensive. And it’s not that romantic, but we love a good trip to Sam’s club. You can eat at their cafe for a few bucks and have fun wandering the isles and people watching. I love going out to eat, so enjoy using my Swagbucks or Shopkick gift cards to pay for dates with my husband, or for Mommy/daughter or Mommy/son dates! And I use coupons to stretch them out. 🙂 I have signed up to get e-mails from some of our favorite restaurants, so I pretty regularly have coupons. Staying home can be fun and let’s face it…it costs nothing! It’s all what you make of it. When we were consumed with paying off debt, we simply had date night at home. It works! Great ideas! Like you mentioned (and it sounds like several other commenters agree), we do an at-home date night almost all the time. The nice thing is that because it’s virtually free, we can manage to do one nearly every week. We have a standing “appointment” that Tuesday is our date night, and we’ll shift to another day if needed. We often will still eat dinner with the kids, because otherwise it seems like it cuts into our “date” time too much. But after they are in bed and the house is cleaned up (hopefully around 7 pm) we will watch a movie, play a game, or just enjoy some couple time. Often with a homemade snack or dessert. My husband and I LOVE to eat out for date nights. Here’s how we do it for free – Target frequently gives Target gift cards (usually $20-$25 worth) if you buy “x” amount of diapers. Having 3 kids in diapers/pull-ups means we can take advantage of this offer a lot!! Then on date night, we go to Target, go to the huge selection of restaurant gift cards and buy one using our Target gift cards. Then on to dinner we go!!! It’s like a reward for changing all those diapers. ?